I would like to think that when it comes to music, many of us tend to carry our favorite tunes on a mobile device – smartphones for the majority of us, while others do have some relics from the previous century such as portable media players and the ilk. The thing is, most of the time, these musical tracks will be listened to via earphones, and whenever you want to share your favorite tunes with someone else, it might not be the most hygienic thing to do to pass your earphones around. Such situations would see the need for a portable speaker, and why not go wireless while you are at it? 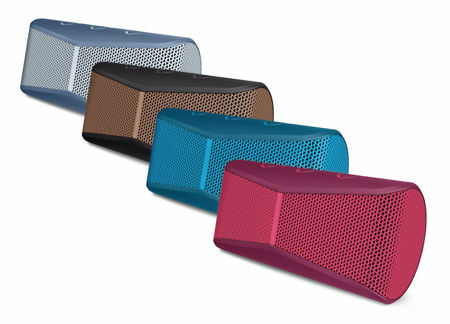 Swiss hardware and computer accessories manufacturer Logitech has come up with their latest creation, the Logitech X300 Mobile Wireless Stereo Speaker. The Logitech X300 Mobile Wireless Stereo Speaker is the ideal tool to have around if you would want nothing more than to share your tunes with the masses. After all, it is summer for those of us living in the northern hemisphere, and that would translate to warmer nights as well as longer days, days which you are able to spend frolicking around, getting enough rest so that you can be recharged for the rest of the year again. The Logitech X300 Mobile Wireless Stereo Speaker will be able to get the job done in double quick time, while looking good simultaneously. Specially designed for mobility and performance, this particular wireless speaker will boast of specially angled drivers that deliver an expansive sound spectrum alongside a precise bass response as well as detailed mids and highs. Not only that, with the inclusion of Bluetooth technology, using the Logitech X300 is a snap. It will play nice with any Bluetooth-enabled device within a distance of up to 30 feet away, where you can then use your mobile device to control the volume level and answer calls directly from the speaker. It also sports a rechargeable battery that ought to deliver up to 5 hours of non-stop playback time.